South Korean Foreign Minister Kang Kyung-wha on Friday asked Romania to play a key role in supporting the Korean Peninsula peace process, especially when it holds the European Union's rotating presidency next year. 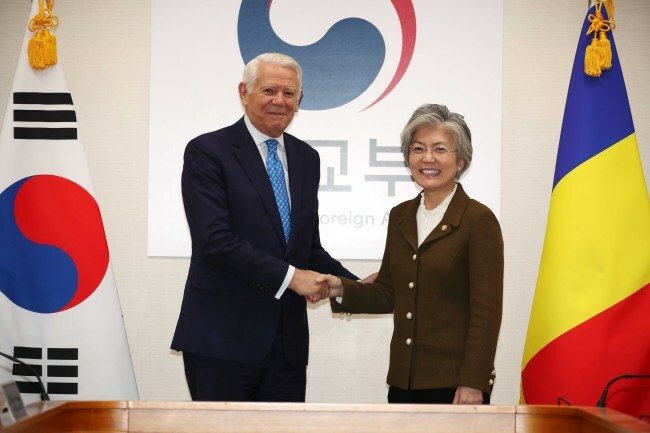 In meeting with her Romanian counterpart, Teodor-Viorel Melescanu, in Seoul, Kang stressed the importance of the European nation's "voice and leadership" at a time when South Korea is concentrating diplomatic efforts on the goal of achieving the complete denuclearization of the peninsula and bringing lasting peace. Romania's top diplomat described South Korea as one of the most important partners for his nation. Improving political and economic ties with South Korea is a major issue for Romania, he added. He said Romania hopes to find substantive ways to help the peace process move forward. During the talks, the two sides also exchanged views on a set of other issues, such as Britain's planned exit from the European Union and cooperation on the global stage, including that of the United Nations. They also agreed to work together to expand two-way trade and investment based on the South Korea-EU free trade agreement. Trade volume between the two countries was tallied at $880 million last year. The Romanian official arrived here Thursday for a three-day stay, as the two sides mark the 10th anniversary of forging a strategic partnership.